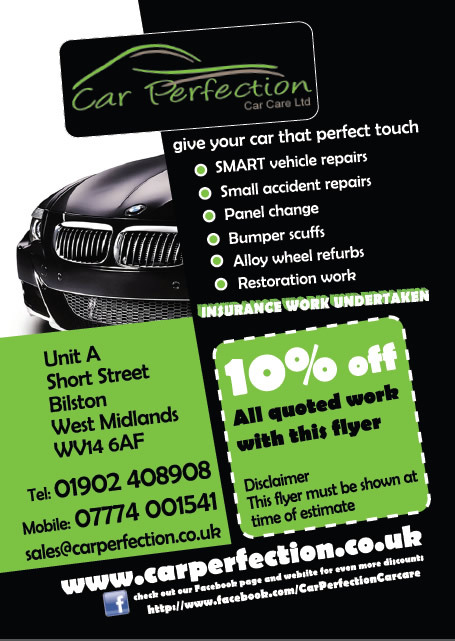 We are offering 10% OFF any work undertaken, such as SMART vehicle repairs, small accident repairs, panel change, bumper scuff repairs, alloy wheel refurbishment and vehicle restoration work. Just click the image to download the leaflet and bring with you at the time of your estimate. Copyright Car Perfection Car Care Ltd © 2019. All rights reserved.